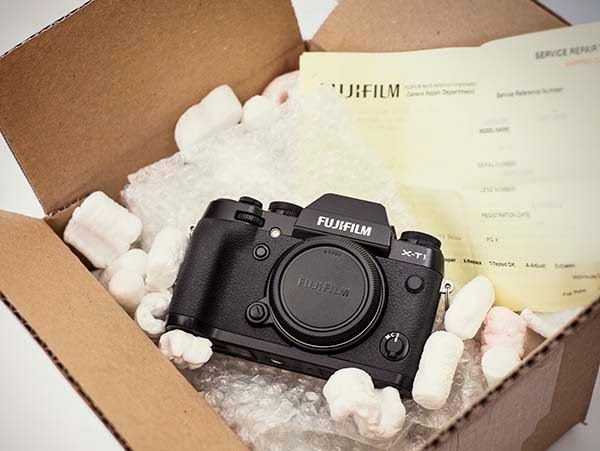 My Fuji X-T1 just returned from Fuji Service Repair for the light leak problem. I sent it out on March 31st, and it arrived back on April 9th -- eight work days. I had included a note about the lack of response on the command dial buttons, but nothing was done to fix them. Their comment was: "There are no updates for rear buttons". I guess this is a repair that is going to have to wait until there is more of a ground-swell of complaints about these buttons. While the X-T1 was out for repair, I had been using my X-Pro1 and X-E2, both of which have much better button response than the X-T1. This may have something to do with the weather sealing, but in comparing the button shapes for the three models, the X-T1 has a definite inset design that makes it harder to locate by feel. The comparison photos below illustrate one of the reasons there is a problem locating the buttons on the X-T1. On both the X-Pro1 and X-E2 the full buttons are raised above the surrounding area, and rounded. The X-T1 buttons, on the other hand, are flat and on the same plane as the surrounding area except for a thin raised ridge on the outside edge. Sooner or later some manufacturer is going to make replacement buttons that stick on top of the existing buttons and serve to raise them up where we can find them by touch. Hmmm...sounds like an idea for a Kickstarter project. Thanks, Tom, for this informative post. Your comparison photos argue against dropping the X-E1 in favor of X-T1 at this point. Despite the enhanced performance of the X-T1 when compared to the X-E1 and X-E2, two factors make me hesitant to upgrade: 1) image quality is just about the same across all X Series cameras: 2) the green foliage smearing issue remains unaddressed in all models, including the X-T1. By the way, have you had problems with smearing of details when dealing with complicated textures, aka, the green foliage smearing problem?